Mr. Mihaylo was born in Los Angeles, California. Industrious and determined even as a young boy, he landed his first job as a paper boy for the Los Angeles Herald Examiner—his penchant for selling taking root. During three years of service in the United States Army’s 101st Airborne Division, Mr. Mihaylo trained with the Southeast Signal School, the Army radio and radar technician’s School. Upon his discharge in 1964, he moved to Tempe, Arizona, and began working for Western Electric, the manufacturing arm of AT&T, as a field services engineer, Mr. Mihaylo worked throughout the Western United States at various locations. Returning to California in 1966, Mr. Mihaylo attended Orange Coast College and California State University – Fullerton, completing a bachelor’s degree in accounting and finance in just 30 months. Graduated from California State University Fullerton, Fullerton, CA. Graduated in 1969 with a BA in Business Administration in Accounting & Finance. Radio and Radar technician – Assigned to the 327th Infantry Group. Responsible for maintaining and repairing electronic equipment. Served in California, Kentucky, Tennessee, Mississippi and Georgia. Field Service Engineer – Responsible for identifying Central Office problems and recommending solutions to the Design Engineering Group in Illinois. Worked throughout the western United States, including the Strategic Air Defense Command site at Cheyenne Mountain, Colorado Springs, CO. Grew from a single employee in one location to nearly 2,000 employees in over 70 locations worldwide with nearly $500 million in annual sales. Successfully competed against such industry giants as AT&T, Nortel Networks, Nippon Electric, Seimens and Cisco Systems in the international business telephone systems and software market for over 38 years. Grew to be the largest and most profitable stand-alone supplier to the mid-sized business telephone systems and software market in the United States with approximately 20% market share. Successfully raised approximately $100 million in four public stock offerings during 1981, 1982, 1995, and 1997. Returned approximately $100 million to shareholders in the form of stock dividends from 1998 to 2007. Returned approximately $200 million to shareholders in the form of stock repurchases (20+ million shares) from 1986 through 2005. Successfully sold Inter-Tel for $750 million in 2007, ultimately returning over $1 billion to shareholders. Type rated in most Lear Jet model aircraft. Type rated in several Cessna Citation aircraft. 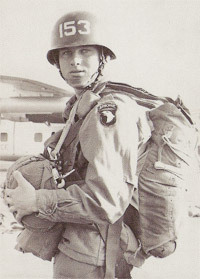 Steve Mihaylo joined the Army in 1961 at the age of 17. He received his technical training in the military. 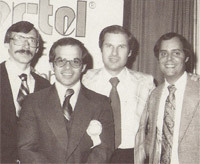 Early Inter-Tel staffers are shown at the 1976 North America Telecom Association Trade Show, one of the first trade shows that Inter-Tel attended. From left to right are Tom Peiffer, Al Maynard, Steve Mihalyo, and Steve Sherman. 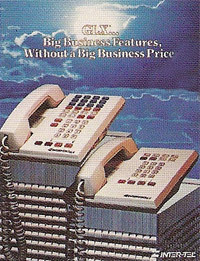 The GLX enabled small businesses to have a phone system with the same features that had previously available only on big PBXs. It established Inter-Tel's position in the small to mid-size business market. Inter-Tel's new 154,000-square-foot headquarters at 6505 West Chandler Blvd in Phoenix. The facility housed administration, warehousing, engineering, and research and development in the same building. Steve Mihaylo and Daisuke Higo, president of Taiko Electronic Works, signing the first agreement between Inter-Tel and Taiko in Toyko in 1973.